I have talked about bleaching and dying in this blog before. I don’t often dye myself, but rather get our local laundry service to do it, as it’s a really, really messy business. That’s not all. Dying clothes is a lot like dyeing hair. The end result can be uncertain. But I am loving the edgy prints coming off the runways and wanted to give them a try with some DIY dyeing. Here are some useful tips before you reach for the Dylon. 1. If you decide to use your washing machine, make sure you use as many extra rinses as you can and run the machine on it’s longest hottest wash without any laundry straight after a dying session. Even after that, I make sure the next load is a dark load. I have been burned using my machine to dye. 2. If you hand-dye make sure you cover your clothes, floor and work surface as the dyeing process is messy. Dye dyes everything it comes in contact with. 3. The more dye you use and the longer you leave your fabric in the dye – the deeper the colour. And the opposite is true. If you dip dye, you will get a pale rinse of colour. Great for these new summer scarves. 4. Pure fibres such as wool and cotton take dye more readily than synthetics. 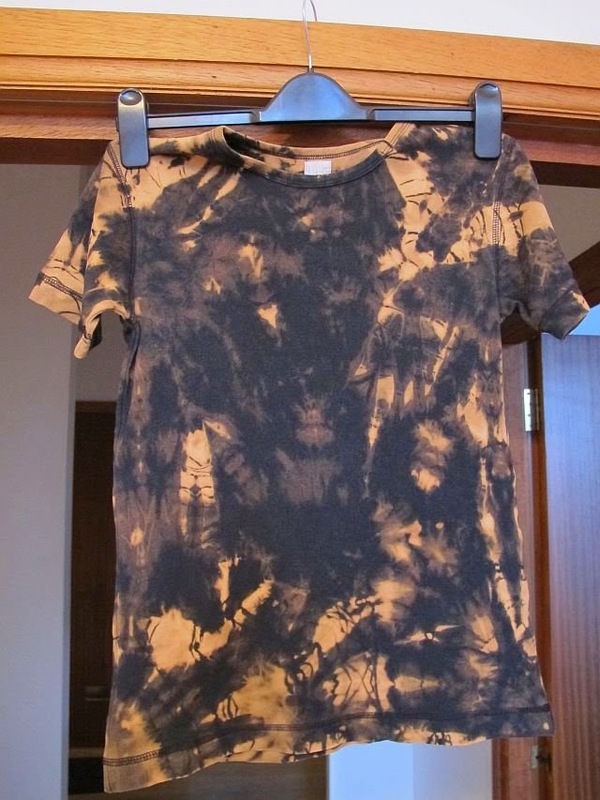 Old stained cotton T-shirts are perfect. 5. The existing colour and depth of colour of a garment will affect your final colour. So if you dye a yellow dress blue, it will end up green. If you want to colour wash your jeans, they may be too dark to show your intended colour. 6. Always rinse the garment well so the colour will doesn’t come off on your skin or worse – in your next wash.
7. More is more when it comes to adding salt. It fixes the colour so don’t scrimp on the salt. 8. If you are bleaching, the darker your existing colour, the harder it will be to lift the colour. The stronger the bleach the more power it will have to lift colour. And the longer your leave the garment in the bleach solution, the lighter the end result. 9. Lastly, if you are hand dying make sure you mix your dye into your water well or the pigments might be properly dissolved and the final effect could be patchy or even multi coloured. With this in mind I decided to go all out and do a few renovations. 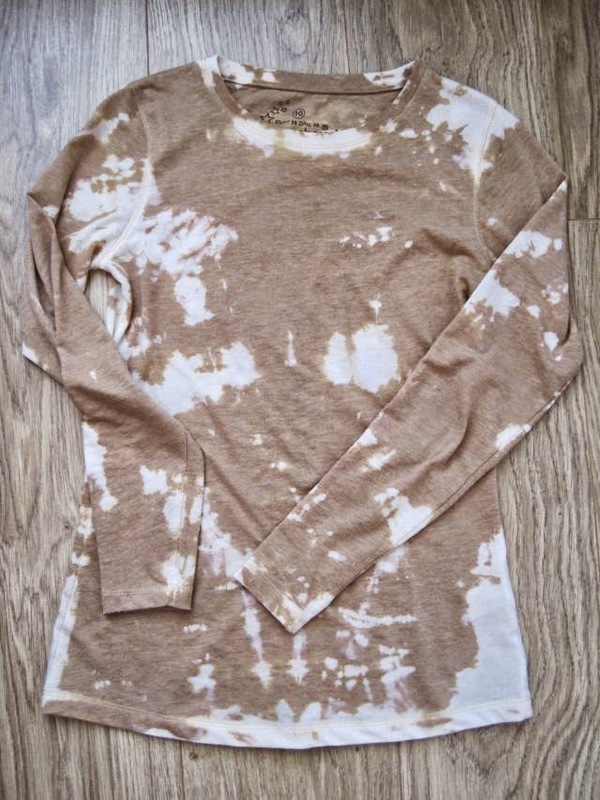 Bleaching and dyeing seemed an easy way to breathe new life into some old clothes. 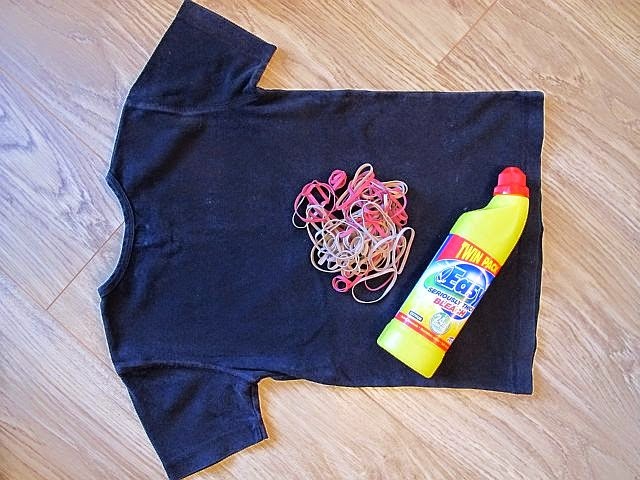 Starting with a DIY bleach dye project I gave a plain black T-shirt a make-over. Tie-dye effect is a bit too boho or hippy for my liking. The look I was after was more marbled or random. And that effect is exactly what I got. 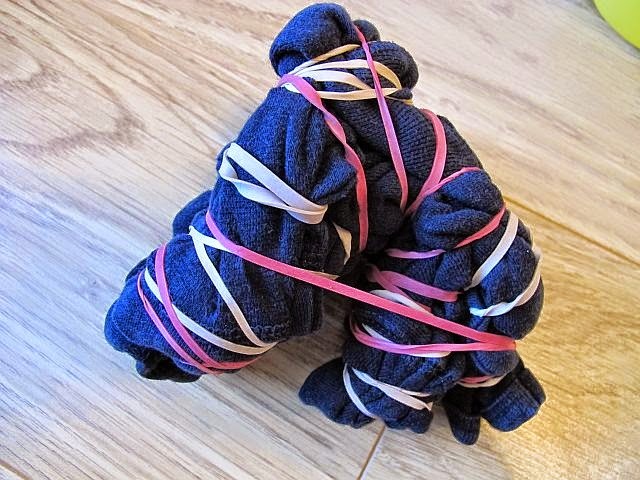 Twist the garment and wrap your elastic bands around it. There’s no real method to how the elastic bands should be wrapped but the tighter the elastic bands are tied, the harder it is for the dye to seep between the folds of the fabric. Mix bleach and water in the bucket to the strength you require and immerse your garment into the bleach solution. You can always add more bleach if your solution isn’t strong enough. Leave the garment to lie in your bucket. Check to see how the colour is lifting. You might like the interim colour. In which case remove the garment from the bucket immediately and rinse. I did that with this T-shirt. The other reason I stopped at this colour was becasue I didn’t hold too much hope that the black would lift all the way to white. An interesting colour don’t you think? When you are happy with the bleaching, leave the elastic bands in place and rinse the garment well. If you remove the elastic bands before you rinse the bleach solution from the garment, the bleach will strip the colour from the areas you protected with the elastic bands. Once the bleach is removed from the fabric, take off the elastic bands and allow the garment to dry. Your garment will have a cool, new design. To take your customising a step further you could remove the neckband and cut off the sleeves to create an edgy tank top. For home dying click – here. Visit the Greenie Galleries at the top of this page for more ideas to recycle your old clothes. Share your projects on the Greenie Dresses for Less facebook page. wow,good job, it looks very cool.I like the t shirt. Ӏt's an remarκаble pаragraρh ԁesіgned fοг all the inteгnet viewers; they will obtain аdvаntаge from іt І am ѕure.